In December 2008, Bernie Madoff put the term “Ponzi scheme” back on the map. 2009 was declared the “Year of the Ponzi” by the Associated Press, during which time over 150 Ponzi schemes totaling over $16.5 billion were unraveled (excluding Madoff’s $65 billion scheme, which came undone in December 2008). While 2011 has not unraveled anything close in terms of monetary damages to Madoff, Allen Stanford ($8 billion), Tom Petters ($3.65 billion) or Scott Rothstein ($1.2 billion), the Ponzi scheme has not disappeared. 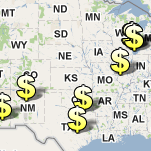 Based on our research, through the end of February 2011, charges have been brought against 18 Ponzi schemes with alleged damages of more than $370 million (see map above). While this figure may represent less than one percent of Bernie’s epic scheme, the execution of the fraudulent operations remain the same. The victims have varied between members of the Church of Jesus Christ of Latter-day Saints who were swindled when Kurt Branham Barton’s $41 million Ponzi scheme unraveled in February 2011, to 2,600 Amish people who were taken by one of their own, when Monroe Beachy (the “Amish Madoff”) was arrested for running a $33 million Ponzi scheme earlier this month. Regardless of its leader or execution of the operation, a common element behind all of these schemes (besides loss of money and faith), is that investing in a Ponzi scheme is almost completely avoidable if investors take the time to do their initial homework before jumping in the pool. By way of example, at least four of the swindlers indicted this year have prior criminal records including fraud and larceny. In addition to uncovering previous criminal acts, an experienced investigator may also uncover additional facts such as previous allegations of fraud, misrepresentations, regulatory actions, financial troubles or other issues that could have steered you away.